My small Arcana order came in recently and I am very happy with what I chose. Thank you Jean for the recommendation! Arcana's newest summer release is themed after the Oregon coast and shore life. 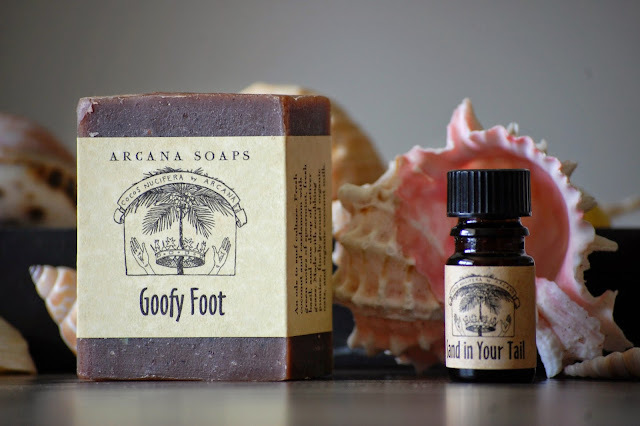 Goofy Foot soap and Sand in Your Tail perfume oil were my picks from this line; thoughts of fall had me choosing a Sleepy Hallow soap too. Deb, you are rubbing off on me. Sand in Your Tail brims over with tropical vanilla. Sweet tobacco leaf and a touch of incense can be detected, as well as a jab of orange blossom that prevents the scent from being too sweet. 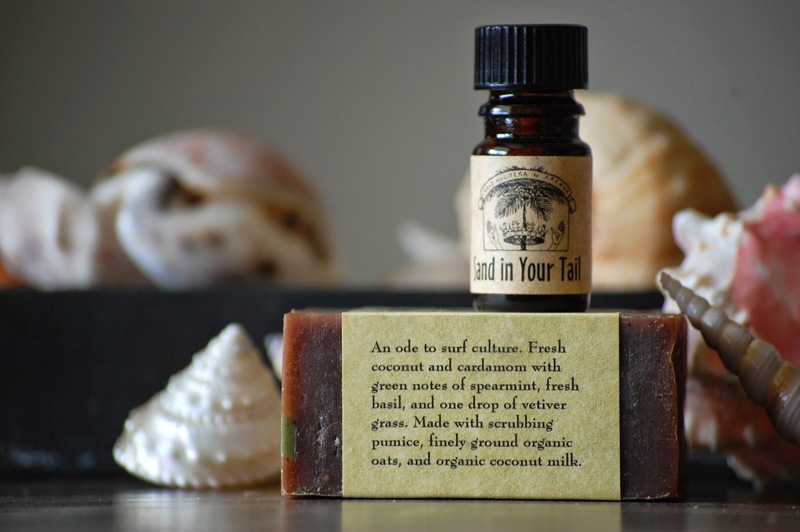 The scent description lists smokey tree resin, ambergris and pink pepper in addition. A subtropical beach is the overall feel of this oil. The sillage is close and personal but still strong... I sniffed my wrist copiously while wearing this; the longevity is great at about 8 hours. Goofy Foot soap is an exfoliating soap. 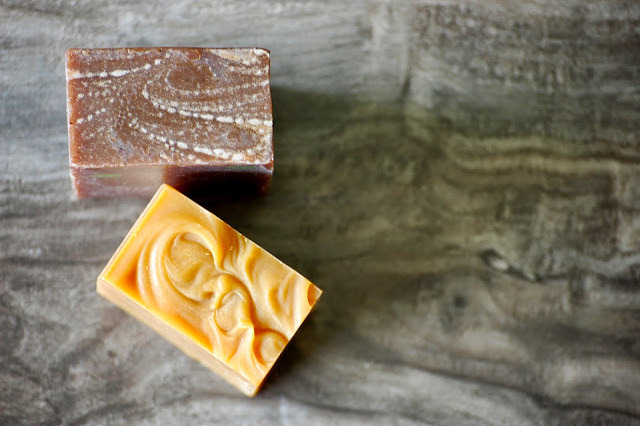 The consistency is nice and firm with a slightly rough surface that becomes more prominent with lathering, as little bits of pumice, oats and coffee beans are exposed. When rubbed directly on the skin it provides excellent exfoliation. If your skin is sensitive I recommend lathering in your hand or on a washcloth and using in that manner. I felt like a sloughed off a year worth of old growth. I was soft, pink and shiny like Mr. Krabs after molting. The scent is beautiful. Fresh raw coconut just pried out of the shell fills my senses, accompanied by a spearmint sprig, and a touch of peppery basil. When I sliced a chunk off to use I actually said "WHAAAT?!" out loud. Look at that. Look how clever it is that it appears as if it IS a cross-section of a coconut... albeit a rectangular coconut... but still! And the green bits of "spearmint" and "basil" floating about add beautiful color. 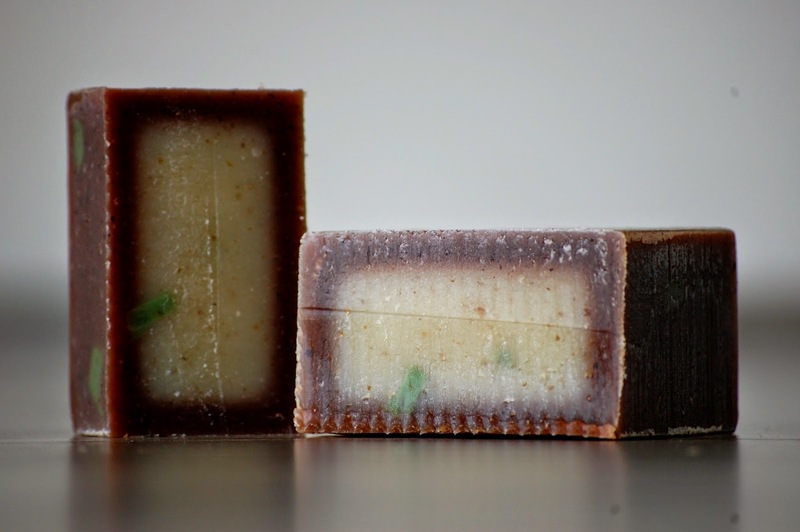 The darker color is from oxidation of the ingredients as the soap cures but I love that it mimics a real coconut. Here is Sleepy Hallow. It is stored away until September 1st, when all things fall start around this house. 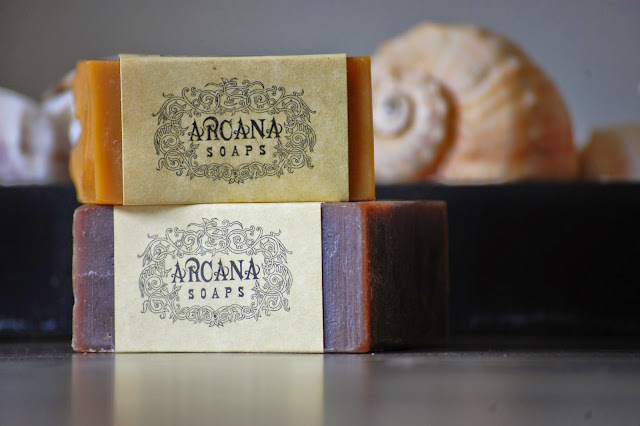 Have you tried Arcana soaps? How do you feel about perfume oils? Hope you have a Goofy day and keep the Sand out of your Tail! Great pictures, I like the way the top of Goofy Foot looks like foam on a beach after a receding wave. Arcana's retailers would be wise to have you work for them taking photos, you use natural light and props well. 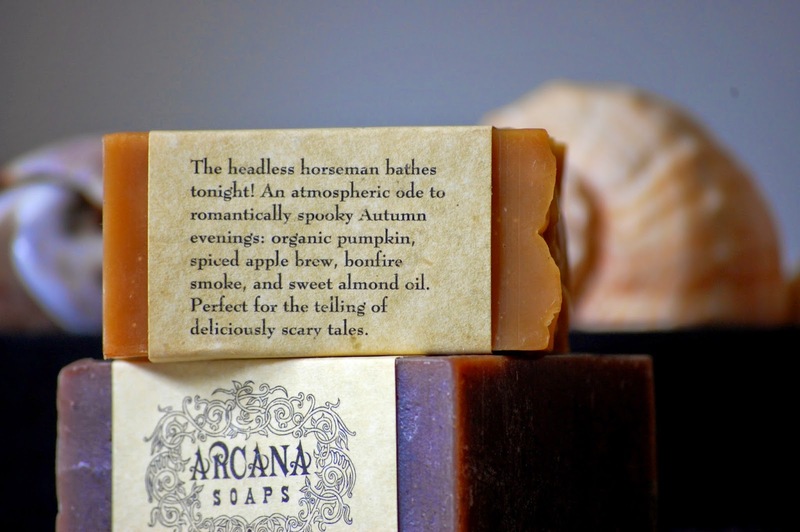 I think Arcana does foody, especially apple, scents really well. 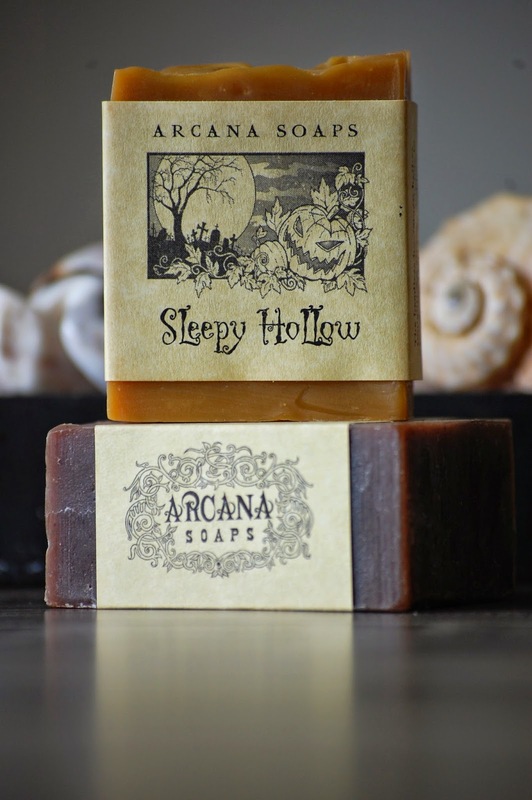 Comfort Me With Apples and Sleepy Hollow are two of my favorite apple blends. If you're looking for another incense blend by the way, Holy Terror has a following from what I've read. I like how September 1st is the beginning of fall for the fall scent lovers. I cling to it being summer until the equinox. I like the top of the soaps too. You are right, it does look like sea foam. So pretty. Thank you for the compliment. Natural light is just so gorgeous. Here in FL it won't feel like fall until November so I fake it as soon as I can with decorating.